Your membership can help us develop and sustain ISUH as an independent voice of our global, transdisciplinary members and strategic partners for health equity in urban settings. In addition, as a member of the ISUH you will receive the benefits below. The Individual membership fee structure is based on the member's country of residence economy type. See World Bank list of economies HERE. To Join, go to the "JOIN HERE" section at the bottom of this page and select the button for "Individual Membership". The Institutional membership fee structure is based on member organizations’ annual revenues. To Join, go to the "JOIN HERE" section at the bottom of this page and select the button for "Institutional Membership". Membership is available for individuals and institutions from high, middle and low income countries. 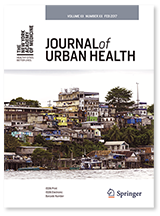 Join today and receive discounted registration for our next International Conference on Urban Health.